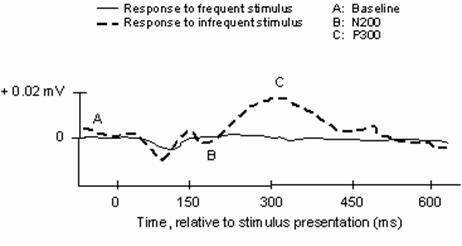 Event-related potentials (ERPs) can reflect the electrophysiological phenomena behind perception & attention. Often, certain time windows are applied for the analysis of ERP peaks (components). I cannot find any explicit justification in the literature why or how those time windows are chosen? E.g., P1 being the largest amplitude between 90 - 120ms. What factors should one consider when choosing time windows, and how ought this to be reported? Electrophysiological responses in general often come in waveforms. These are characterized by a number of peaks and troughs. Dependent on the specific response, arbitrary naming conventions are used. Generally something along the lines of P1 (positive peak #1), N1 (negative peak #1), P2 etc. Sometimes latencies are used as a subscript too to indicate which peak it is. The timing of ERP peaks is more of a convention than anything else. 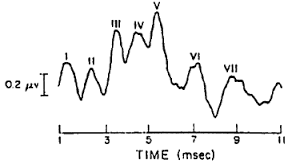 In fact, electrophysiological responses often have specific latencies, but only specified in a certain range. Age, medical conditions, random recording variability, equipment and analysis method may all affect the specific peak latencies. Generally spoken, there are three main methods to characterize positive (P) and negative (N) deflections in electrophysiological responses. The 1st method simply denotes the first positive peak as P1, the first negative peak as N1, the second positive peak as P2 and so forth (Fig. 1). Auditory CAP recordings are designated this way, for example. Alternatively, deflections may be designated a number that indicates their approximate latency. For example the P300 is an often encountered wave in oddball-paradigm ERPs. The P300 relates to the subject's attention to the task at hand. Given the higher-order processing involved, it appears relatively late in ERP recordings namely around 300 ms or so (Fig. 2), hence the name P300. Another commonly applied notation are Roman numerals; PI, NI, PII etc. ABR peaks are often designated this way (Fig. 3). In the end, the rationale you are talking about is all about conventions, approximations and generalizations. In fact, when people investigate specific responses that are not yet characterized by generally accepted conventions, the authors often just make something up along the lines pointed out above. As long as you define it specifically in your report whether it is a longstanding accepted scientific convention, or a simple customized numbering devised by your lab, it's all OK, really. Not the answer you're looking for? Browse other questions tagged terminology eeg electrophysiology or ask your own question. 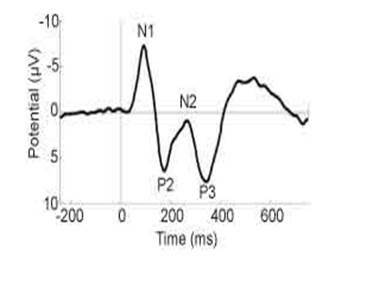 How to analyze auditory steady state responses? How do you call a study in which subjects were deceived about the real purpose?